Israeli forces continued with systematic crimes, in the occupied Palestinian territory (oPt), for the week of 18 – 24 October, 2018. Israeli forces continued to use excessive force against unarmed civilians and peaceful protestors in the Gaza Strip. 7 Palestinian civilians were killed in the 31st week of the Return and Breaking Siege March. 298 civilians, including 68 children, 13 women, 3 journalists and 9 paramedics, were wounded; 14 of them sustained serious wounds. During the reporting period, the Israeli forces escalated their murders as 11 palestinian civilians were killed, including 3 children. In the Gaza Strip, the Israeli forces killed 10, including 3 children. Seven of those killed due to the use of lethal force against Palestinian protesters, who participated in peaceful demonstrations organized within the activities of the “Great March of Return and Breaking the Siege” in the Gaza Strip, which witnessed for the 31st week in a row peaceful demonstrations along the eastern and northern Gaza Strip border area. Meanwhile, the 2 children were killed in an airstrike carried out by the Israeli warplanes in violation of the principles of necessity and distinction. During the Protests in the Gaza Strip, the Israeli forces wounded 289 civilians, including 68 children, 13 women, 3 journalists, and 9 paramedics. The injury of 14 of them was reported serious while a civilian was wounded during a shooting incident near the border area. In the West Bank, the Israeli forces killed a Palestinian civilian and wounded 16 others, including a child, journalist and 2 paramedics. In the Gaza Strip, on 26 October 2018, Israeli forces killed 4 protestors; 3 in eastern Khan Younis and 1 in northern Gaza Strip, during their participation in the 31st Friday Protests within the Great March of Return and Breaking the Siege. In the next two days, 2 of those wounded on Friday succumbed to their wounds. On 29 October 2018, a protester was killed while participating in the protests occurred off Zikim Military Base, northwest of Beit Lahia in the northern Gaza, increasing the number of those killed in protests to 7.
in a new crime of excessive use of lethal force, which reflect the highest degree of recklessness of the lives of Palestinian civilians, Israeli forces killed 3 Palestinian children after targeting them with a missile in the border fence area with Israel, east of Wadi al-Salqa village, in the central Gaza Strip. 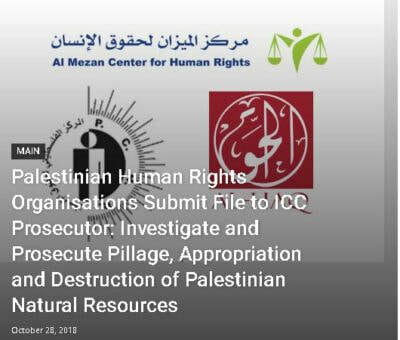 Investigations conducted by the Palestinian Center for Human rights (PCHR), indicate that the airstrike violates the principles of necessity and discrimination and the use of force was excessive, especially that the 3 children were civilians and unarmed. The Israeli forces claimed that placed an explosive device near the border fence, but paramedics at Palestine Red Crescent Society (PRCS), who retrieved the dead bodies of the 3 children confirmed that the children did not have anything and they found them on the border fence in the Palestinian side. 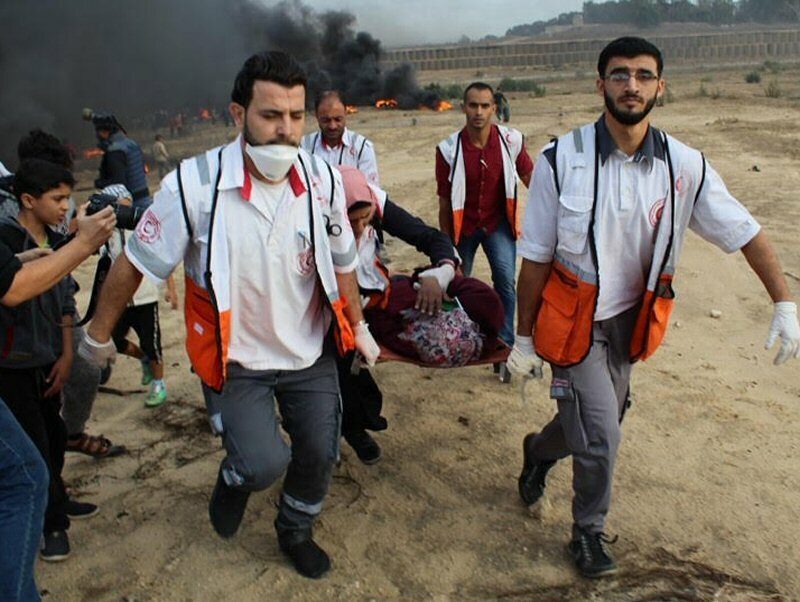 As part of using excessive forces against the peaceful protests along the Gaza Strip borders, the Israeli forces during the reporting period wounded 298 civilians, including 68 children, 13 women, journalists and 9 paramedics. Fourteen of those wounded sustained serious injuries. As part of the Israeli airstrikes, the Israeli warplanes carried out dozens of airstrikes targeting military training sites belonging to the Palestinian Armed Groups and other targets, causing complete destruction of them. Moreover, the nearby houses and civil objects sustained damage such as the Indonesian Hospital, Golden Hall for Weddings, al-Nawras Resort in Beit Lahia, al-Tawil Company for Auto Repair and Kuhail Contracting Company. In addition, al-Kamal Building comprised of 4 floors and built on an area of 250 square meters was destroyed in central Gaza City while classes were suspended in Ibn al-Nafis Primary School in Bani Suhaila. As part of targeting the border areas, on 28 October 2018, the Israeli forces stationed along the border fence between the Gaza Strip and Israel, southeast of Beit Hanoun opened fire at a group of bird hunters, wounding one of them with a bullet to the buttock. In the West Bank, on 26 October 2018, the Israeli forces killed Othman Ladawdah (34) during his participation in a demonstration comprised of 250 civilians from the Western Farm Village, northwest of Ramallah in Kherbet Na’lan area which Israeli settlers from Kirim ‘Alim storm every Friday to perform Talmudic prayers in an attempt to seize it. During the reporting period, the Israeli forces wounded 16 Palestinian civilians, including a journalist and 2 paramedics. During the reporting period, Israeli forces conducted at least 55 military incursions into Palestinian communities in the West Bank and 6 similar ones into Jerusalem and its suburbs. During those incursions, Israeli forces arrested at least 49 Palestinians, including 5 children, in the West Bank. Meanwhile, 12 other civilians, including 3 children, were arrested in Jerusalem and its suburbs. As part of the Israeli house demolitions and notices, on 29 October 2018, the Israeli forces demolished a newly built house in al-Fheidat neighbourhood in ‘Anata village, northeast of occupied Jerusalem, belonging to Saleh Fheidat. The 50-square-meter house that is of one floor sheltered a family of 5. It should be mentioned that the Israeli municipality demolished another house, which was built 80 years ago, 2 months ago. Fheidat said that he was not warned or noticed that his newly built house would be demolished by the municipality and that the demolition was surprisingly carried out. Moreover, on 28 October 2018, the Israeli municipality handed 3 civilians from al-Waljah village, northwest of Bethlehem, notices to refer to it for investigating “violations committed relevant to unlicensed construction”, noting these houses were demolished a month ago. As part of demolition of houses and other civil objects, on 29 October 2018, the Israeli forces levelled 23 dunums and property belonging to civilians in western Beit Oula village, west of Hebron. On 31 October 2019, Israeli forces demolished 2 agricultural rooms in Kherbet Khelet al-Foron, south of Bani Na’im village, east of Hebron. As part of the Israeli settlers’ attacks against the Palestinians civilians and their property, on 28 October 2018, the guard of “Eili” settlement namely Yousi attacked the Secretary of Qaryout village council, Mofid Jamil Abu Murrah (56), and Member of the village council, Khairy Mohammed Hasan Marawdah (53) on Batishah Road, west of the abovementioned village, southeast of Nablus. Both of them were in Batishah area within Area B supervising the establishment of the base course within a project funded by the First Aid Society. The guard beat them up and threw a sound bomb at the bulldozer that was spreading the base course and belonging to the village council. The Northern Gaza Strip: Israeli forces killed Mohammed Khalid Mahmoud Abdul Nabi (27), from Jabalia, after firing a live bullet to the head. Moreover, 55 civilians, including 17 children, 3 women, a paramedic, were wounded. Fifty two of them were hit with live bullets and their shrapnel and 3 were hit with tear gas canisters. medical sources classified 4 civilian’s injuries as serious. The wounded paramedic was identified as ‘Ala’a Sha’ban Mohammed Sabbah (39), a paramedic at the Palestinian Civil Defense, was hit with a live bullet shrapnel to the feet. The Israeli forces also targeted 2 ambulances, one of them belongs to Palestine Red Crescent Society (PRCS), which was hit with a live bullet to the left door and the other belongs to the Military Medical Services and was hit with a live bullet and 4 shrapnel to the left side. In Gaza City: 89 civilians, including 17 children, a journalist, were wounded. Fifty two of them were hit with live bullets and their shrapnel, 7 were hit with rubber bullets and 30 were hit with tear gas canisters. The wounded journalist was identified as Bilal Khalil Noufal, a photojournalist at Seraj Media Office, was hit with a live bullet to the left thigh. Nassar Eyad Nassar Abu Taim (19), from Bani Suheila, east of Kahn Younis, was hit with a live bullet to the head. Ahmed Sa’ed Abdul ‘Aziz Abu Lebdah (22), from Bani Suheila, east of Khan Younis, was hit with a live bullet to the chest. ‘Ayesh Ghassan ‘Ayesh Sha’ath (23), from al-Fukhari, east of Kahn Younis, was hit with a live bullet to the head. Moreover, 52 civilians, including 10 children, a woman and a journalist, were wounded. Forty four of them were hit with live bullets and their shrapneland8 were hit with tear gas canisters. Doctors classified 3 civilian’s injuries as serious. The Central Gaza Strip: 56 civilians, including 17 children, 8 women, 4 paramedics, including 3 female paramedics, were wounded. 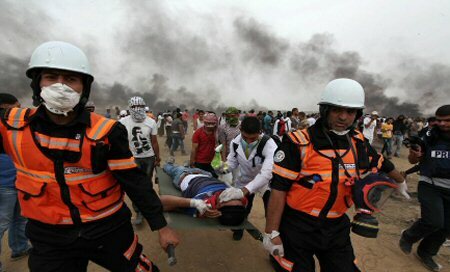 Fifty three of them were hit with live bullets and their shrapnel and 6 were hit with tear gas canisters. Doctors classified 4 civilians’ injuries as serious. At approximately 02:30 on Saturday, 27 October 2018, medical sources at al-Shifa Hospital in Gaza City announced the death of one of the wounded civilians namely Mojahed Ziyad Zaki ‘Aqel (24), from al-Nuseirat refugee camp, succumbing to his wounds. Mojahed was hit with a live bullet to the upper thigh. At approximately 02:00 on Sunday, 28 October 2018, medical sources at al-Shifa Hospital announced the death of another wounded civilian namely Yahiya Bader Mohammed al-Hasanat (37), from al-Moghraqah village, was hit with a live bullet to the head. Hala ‘Ata ‘Eqab Abu Thaher (22), from al-Buraij refugee camp, was hit with a shrapnel to the abdomen. Basmah Maher Fehmi Weshah (27), from al-Buraij refugee camp, was hit with live bullet shrapnel to the feet. Ibrahim Husni Shaheen (29), from al-Nuseirat refugee camp, was hit with live bullet shrapnel to the right leg. It should be noted that the 3 paramedics worked at the Union of Health work Committee. Rajab Husein Rajab al-Khaldi (27), a volunteer paramedic at the Palestinian Ministry of Health from al-Buraij, was hit with a live bullet to the right leg. Rafah City: 12 civilians, including a child, a journalist and a paramedic, were wounded. Ten of them were hit with live bullets and their shrapnel and 2 were hit with tear gas canisters. Doctors classified 3 civilians’ injuries as serious. The wounded journalist identified as Mahmoud Mohammed Sa’ed Shata (25), who works at Forasan Press, was hit with a tear gas canister to the left leg. The wounded paramedic identified as Yasser Rafiq Mohammed Abu Habib (26), paramedic volunteering within Nabd al-Hayah Medical Team, was hit with a shrapnel to the upper part of his body. At approximately 15:00 on Monday, 29 October 2018, dozens of Palestinian civilians gathered near the border fence between the Gaza Strip and Israel upon calls from the Supreme National Authority for the March of Return and Breaking Siege in which they called for participation in the Return coastal camp located in al-Sefa area, adjacent to “Zikim” military base, northwest of Beit Lahia in the northern Gaza Strip. It should be noted that this is the 14th time for Palestinian boats to sail for Breaking the Siege, which was launched from Gaza Seaport towards the northern Gaza Strip coastline adjacent to the abovementioned camp. The Israeli gunboats heavily fired live bullets and sound bombs at the boat of Breaking the Siege that approached the waster barrier established by the Israeli forces and extends to the border fence. The Israeli forces claimed that they established the border fence fearing of naval infiltration. Meanwhile, Israeli soldiers stationed behind sand barriers and cement cubes heavily opened fire and fried a large number of tear gas canisters at Palestinian civilians participating in the demonstration and approached the coastline. As a result, Mahmoud Abdul Hai Ahmed Abu ‘Obadi (25), from al-Shati’a refugee camp, west of Gaza Strip, was killed after being hit with a live bullet to the chest. Sixteen civilians, including 2 children, a woman and 2 PRCS paramedics, were hit with live bullets and their shrapnel. The paramedics were identified as Suleiman Mohammed Salman al-Zawa’ah (30) was hit a live bullet to the right leg and Hani Mahmoud Husein Wadi (33) was hit with a shrapnel to the chest. Moreover, 19 civilians, including 7 children and a paramedic, were hit with tear gas canisters. The wounded paramedic identified as Yusuf Ramzi Mohammed Daif Allah (21), a paramedic volunteering at Algerian Medical Team, was hit with a tear gas canister to the head. Following the Friday prayer on 26 October 2018, about 250 Palestinian civilians from different ages from l-Mazra’ah al-Gharbiyah village, northwest of Ramallah organized a demonstration in “Kherbet Na’lan” area. At approximately 14:00, they attempted to confront Israeli settlers and soldiers, who were about 50-70 settlers and soldiers. The protestors set fire to tires and threw stones at the settlers and soldiers in an attempt to prevent the settlers from performing the Talmudic prayers and controlling the area. The Israeli soldiers fired rubber bullets, sound bombs and tear gas canisters at the protestors, who were about 30 meters away from them. The clashes continued for 2 hours and a half. As a result, 4 civilians, including a child, were wounded. They were transferred via a PRCS ambulance to the Istishari Arab Hospital in al-Raihan Suburb, north of the city. Doctors classified their injuries as moderate. At approximately 17:00, a number of young men moved forward the Israeli Border Guards, who moved back about 30 meters away from the clashes’ area and stationed in a low area near “Kerem ‘Elim” The young men threw stones and empty bottles at the soldiers. In less than 5 minutes, a soldier from the Border Guard forces directly fired 10 consecutive live bullets at the young men. As a result, 10 civilians, including a journalist and 2 paramedics belonging to the Medical Relief crews, were wounded and then transferred to the Istishari Arab Hospital. Medical sources announced the death of ‘Othman Ahmed ‘Ali Ladadwah (34), who was hit with a live bullet to the left side of the thigh that settled in the lung. The wounded journalist identified as Hamzah Mohammed Shriteh (24), a photojournalist at the Website of the abovementioned village, was hit with a live bullet to the foot. The 2 wounded paramedics identified as Mohanned ‘Abbas Hannoun (20), was hit with a live bullet to the hand, and Mohammed ‘Emad Sa’aidah (32), was hit with a live bullet to the arm. Following the same Friday prayer, dozens of Palestinian youngsters gathered in al-Zawiyah Gate area in the center of Hebron. They set fire to tires and threw stones at Israeli soldiers stationed at Checkpoint (160). The soldiers fired sound bombs and tear gas canisters at them. the soldiers also set up ambushes to arrest the protestors. They then arrested Ayman ‘Ammar Abu ‘Aishah (14) and then took him to the checkpoint on al-Shuhada’a Street. On Sunday, 28 October 2018, the Israeli authorities handed 3 civilians, from al-Waljah village, northwest of Bethlehem, notices to refer to the Israeli Municipality in Jerusalem, in order to question them about building without a license. Activist Ibrahim ‘Awadallah said that the Israeli forces moved into ‘Ain Jowizah and Khelet al-Samak areas and handed Hanan Mohamed al-Razim, Khaled Mahmoud Abu Khiarah and ‘Alaa Hussain Hajajlah notices to refer to Qatar’s Planning and Building Committee in order to question them about building their houses without license, noting that their houses were demolished a month ago. It should be noted that the Israeli forces lately demolished 4 houses and notified 8 others to stop construction work in al-Waljah village. At approximately 06:00 on Monday, 29 October 2018, Israeli vehicles demolished a new residential house in al-Fahidat neighborhood in ‘Anatah village, northeast of occupied Jerusalem, under the pretext of non-licensing. Salah Fahidat said that the Israeli Municipality staff accompanied with Israeli forces raided his house on Monday morning, expelled his family member and then evacuated the house. He added that the Israeli vehicle demolished his 50-square-meter house, where he along with his 5 family members lived. Salah clarified that the Israeli Municipality demolished another house belonging to him 2 months ago and was an old one built over 80 years ago. He pointed out that the Israeli Municipality did not warn him to demolish his new house, clarifying that they raided the house and immediately demolished it. Hijazi Mohamed ‘Abed al-Raheem Torshan (50): leveling 13 dunums planted with olive trees 5 years ago and damaging stone chains. Mohamed Suliman Mahmoud al-‘Adam, leveling 10 dunums planted with 30 olive and 20 almond trees and demolishing stone chains in addition to damages from the Israeli Civil Administration which included 2 water wells, damaging stone chains and uprooting olive and almond trees. ‘Azmi Mohamed Suliman al-‘Emlah (44), cutting iron bars and confiscating them with the fence. At approximately 09:00 on Wednesday, 31 October 2018, Israeli forces accompanied with military vehicles and a vehicle of the Israeli Civil Administration and a bulldozer moved into Kherbet Khelet al-Forn, south of Bani Na’iem village, east of Hebron. The Israeli soldiers deployed in the lands overlooking Bypass Road 356 and then demolished two 50-sqaure-meter agricultural rooms belonging to Majed Mohamed Ibrahim Burqan (55). The rooms were demolished under the pretext of building without a license in area classified as Area C. The rooms were used for breeding livestock. Kherbet al- Khelet is located to the west of the Bypass Road 356, adjacent to the intersection leading to “Bani Hefer” settlement established on the lands of Bani Na’iem village. The residents of Kherbet al- Khelet work in agriculture and breeding livestock and most of them are Bedouins. The approval rate, in September, for an Israeli permit to leave Gaza for treatment abroad, for those injured in the March of Return protests near the border fence with Israel, was significantly lower than the overall approval rate: one of 18 applications, or 1%, was approved; one denied; and 16 delayed, the World Health Organization (WHO) said, in its monthly report on health access for Palestinian patients in the occupied territories, published on Wednesday. It said that, overall, only 58% of applications for a permit to leave the besieged enclave, through Israel, for medical treatment in East Jerusalem or West Bank hospitals, were approved in September. A total of 1,074 (555 male; 519 female), or 58% of the 1,837 applications to cross Beit Hanoun/Erez crossing between Gaza and Israel, in September, were approved. Over a third (37%) of permits approved were for children under age of 18, and almost a fifth (22%) were for elderly people over 60 years of age. The report said 95 patient applications (66 male; 29 female), or (5%) of the total, were denied permission to cross Erez, for health care, in September. Those denied included seven children under the age of 18 years and 14 patients aged 60 years or older. A total of 18% of denied applications were for appointments in neurosurgery, 17% for ophthalmology, 17% for orthopedics, and 12% for cancer treatment and investigation. More than 90% of denied permit applications were for appointments at hospitals in East Jerusalem or the West Bank. WHO said that 668 patient applications (394 male; 274 female), or 36% of the total, were delayed access to care, receiving no definitive response to their application by the date of their hospital appointment. Of these, 161 applications were for children under the age of 18 and 71 applications were for patients aged 60 years or older. Of the 668 delayed applications, 16% were for appointments in oncology, 15% for orthopedics and 10% for ophthalmology. The remaining 59% were for 26 other specialties. Of the 1,837 applications to cross Beit/Hanoun Erez for health care, in September, 30% were for children under age of 18, 17% were for patients over the age of 60 and 45% of applications were for female patients. Two-thirds (67%) of applications to cross Erez were for appointments in East Jerusalem hospitals, less than a fifth (18%) were for Israeli hospitals and less than one in six (15%) were for hospitals in the West Bank. Makassed Hospital (29%) and Augusta Victoria Hospital (29%), both in East Jerusalem which the United States recently stopped all funding to, received three-fifths of referrals. Permit applications for the top five specialties accounted for more than three-fifths (63%) of referrals: oncology (30%); hematology (9%); pediatrics (9%); orthopedics (8%); and ophthalmology (7%). The remaining referrals were for 25 other specialties, according to WAFA.